AncestorPuzzles.com: Mugbooks- Genealogical Gold or Tall Tales? Sometimes I wish I had a time machine to go back in time and interview my ancestors. But even if this were possible, it would still be oral history. Oral history is subject to the unreliability of human recollection. It is not uncommon for different branches of the family to have very different versions of the family oral history. But I do get excited when I find a biographical sketch for an ancestor in a 19th century mugbook. I recently ran across an example of one of these biographical sketches while doing some research for my friend, Brad Stone. His ancestor, George W. Stone was featured in the Reminiscent History of the Ozark Region published in 1894. In addition to the fact that these biographies require verification, they can also be very confusing in the way that they are written. The George W. Stone biography has been edited below as a first step toward verification. The added information is contained in brackets. From [Tennessee] [John and Maria (Bayless) Stone] removed to Greene County, Mo., and [before 1848] to Ozark County, [Missouri], where Mr. [John] Stone died when the subject of this sketch [G.W. 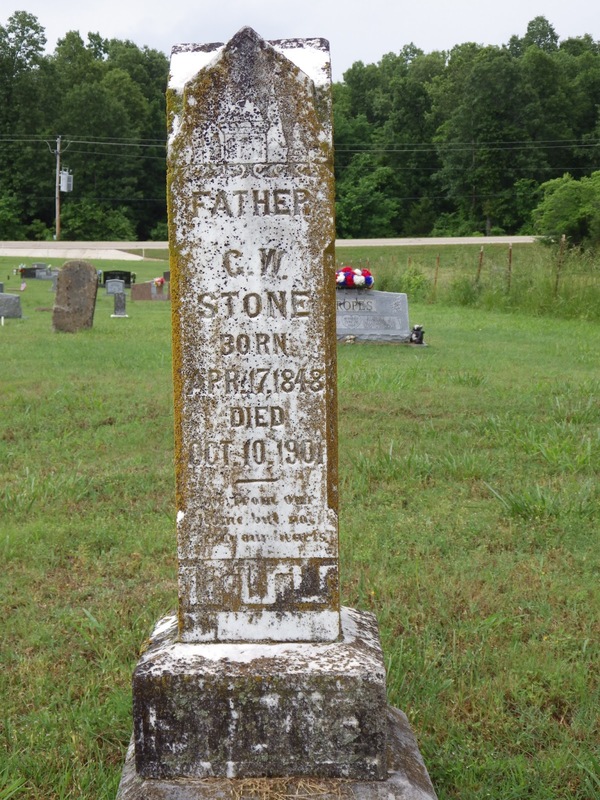 Stone] was very small [Estimated death date is before 1860 based on the fact that he is missing from the family in the 1860 census.]. In 1862 [Maria Bayless Stone and her children] removed to Marion County, Ark., where Mrs. Stone breathed her last about 1882, having long been a member in good standing of the Christian Church. Her father was a farmer of Tennessee and died in that State. The paternal grandfather [Robert Stone] was also a Tennesseean and reared four sons: John, Edward, William and David, all of whom died in Missouri. [G.W. Stone] was the youngest save one of the following [children of John and Maria (Bayless) Stone]: Sarah, who died in Marion County, the wife of James Cain; Louisa, who also died here, the wife of Robert Long; Mary Jane, who became the wife of Andrew Benton, and died in Marion County; Adaline, who died in Marion County, the wife of A. C. Musick; Julia Ann, who became the wife of William Lance, also died in this county; Edward Marion, died in this county in 1863; Amanda, became the wife of Joel A. Presley and died in Marion County; George W. and Serepta, who died young. George W. Stone remained with his mother until he reached manhood, but owing to the fact that he assisted her in every way in his power and to the scarcity of schools, his education was not of the best. In 1873 he married Marinda Jane, daughter of John Porter, who died in Woodruff County, Ark., when Mrs. Stone [Marinda Jane Porter] was quite small. She was born in that county and there died about 1876, leaving two children: Marion and Druscilla, the latter named for her grandmother Porter, who now  lives in Marion County, the wife of G. B. Forrest. In 1881 Mr. Stone married Lucina[Lusana], daughter of Robert and Rachel Forrest, who were born and spent many years of their lives in Ozark County, Mo., but are residents of the State of Washington [since 1880], where they have become comparatively wealthy during their fourteen years' residence there. Mrs. [Lusana Forest] Stone was born in Ozark County, and by Mr. [G.W.] Stone is the mother of seven children: Everet Clarence, Walter, Ida Belle, Frank, Cora, Charley and Nora. Since the time of his first marriage  Mr. [G.W.] Stone has resided on his present farm, but at that time only a few acres had been cleared and a small log cabin erected thereon, for which he paid the sum of $25;. He now has a fine bottom-land farm of 152 acres, about seventy of which are cleared and under cultivation. His place is nicely improved with excellent buildings of all descriptions and he always has an abundance of fruit of various kinds. In 1893 he erected a gin, saw and corn mill, all of which net him a satisfactory income. Besides this valuable property he is the owner of some extremely desirable mineral claims. He has followed farming all his life, has made it a success, and is considered one of the substantial men of his section. For the past fourteen years [since 1880] he has been a director in his school district, and he has ever been an earnest advocate of the free-school system, and is a patron of all progressive measures generally. He and his worthy wife are members of the Christian Church and politically he has been a lifelong Democrat, and his first presidential vote was cast for Horace Greeley in 1872. A Reminiscent History of the Ozark Region: comprising a condensed general history, a brief descriptive history of each county, and numerous biographical sketches of prominent citizens of such counties. Chicago: Goodspeed Brothers Publishers. 1894. AccessGenealogy.com. Web. 31 January 2016. The first problem that I noted in the transcript on Access Genealogy was that it did not cite a page number so I looked for an original version in the Family Search Book collection. George W. Stone was not listed in the table of contents so I downloaded the PDF and a did a search of the document for "George W. Stone." The biography was found on page 640 and 641. This biography is packed with information about the family and ancestors of George W. Stone. Most of the information has been substantiated by census and other sources. One particularly vexing problem is that an 1870 census record has not yet been found for G.W. Stone or his mother. This is probably due to a transcription error. After the writing of this biography, George W. Stone and Lusana Forest Stone had two more daughters. 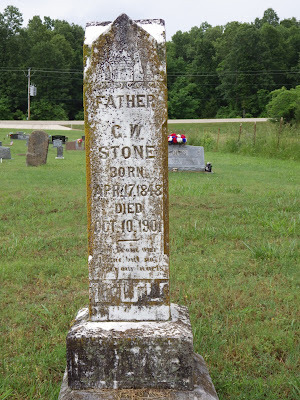 George W. Stone died on October 10, 1901 in Marion County, Arkansas. He was originally buried in the Wildcat Cemetery but the grave had to be relocated due to the construction of Bull Shoals Reservoir. His FindaGrave Memorial has a photo and tells the story of his burial, exhumation and reburial.